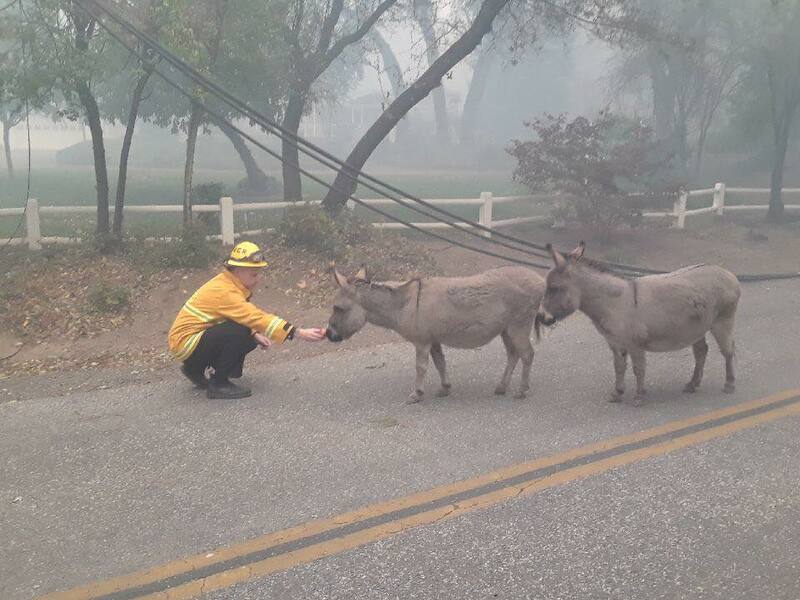 Helpers on the front lines of the Paradise, California fire, although exhausted, stopped when they encountered two very scared donkeys along Honey Run Road on Saturday. 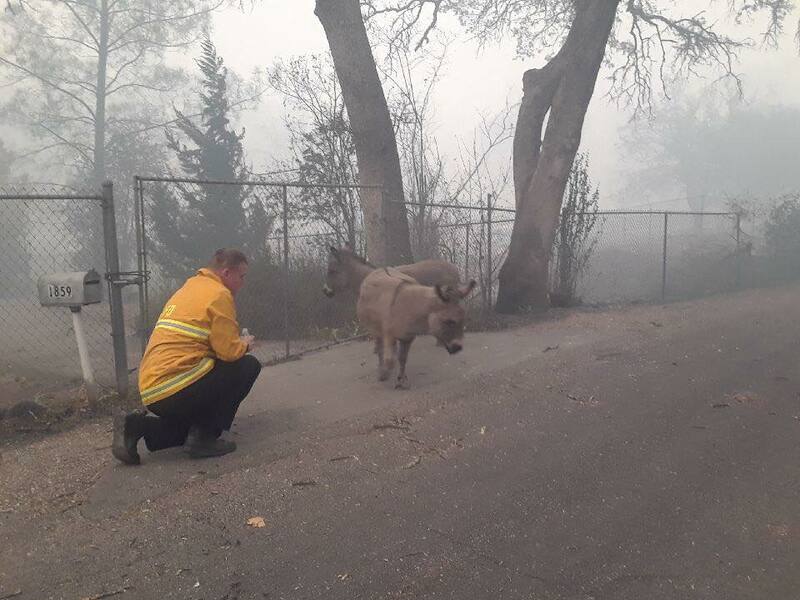 Firefighters Chris Harvey and Sacramento Fire Chief Gary Loesch spotted the weary donkeys who were clearly lost and frightened. According to the Sacramento Fire Department Facebook page, Harvey and Loesch had been on their way to investigate an accident caused by a fallen tree when they encountered the two donkeys. The men stopped, and as they backed away to let the animals pass, the men cupped their hands to offer the donkeys some water. And then they grabbed the apples in Loesch’s lunch bag and fed them to the animals. 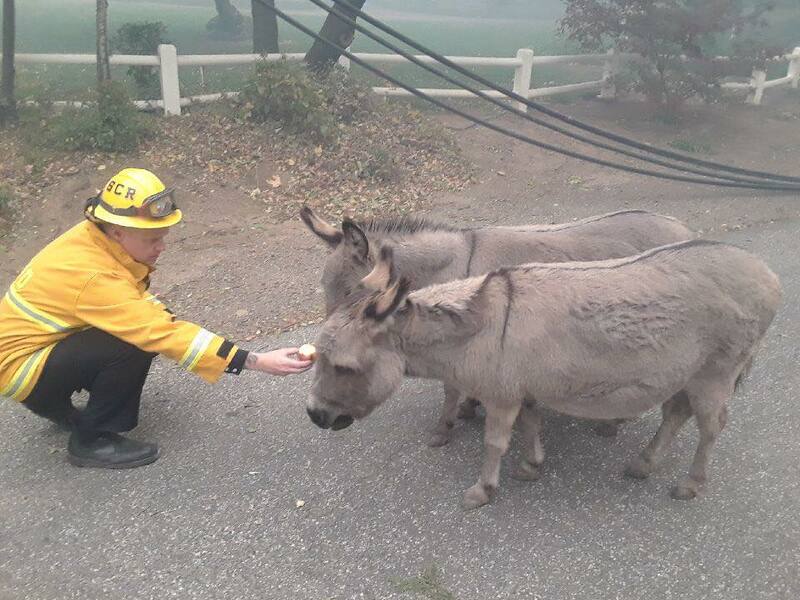 “In an area completely devastated by the #CampFire, SFD Fire Chief Gary Loesch and firefighter Chris Harvey came across these two donkeys walking down the center of the street looking very sad, thirsty and hungry. Animal control was dispatched to rescue the animals and SFD fed them apples while they waited,” the organization posted on their social media page. The men contacted base camp and animal control officers were dispatched to get the donkeys. The donkeys, Petunia and Scooter, have since been reunited with their families. Thousands of reports about abandoned animals separated from their families have been flooding social media; photos and video of the volunteers, firefighters and good Samaritans helping are heartwarming. We love all of these random acts of kindness. Follow the National Pet Rescue on Facebook for the latest animal related news. Yesterday in the news: Owners didn’t show up to claim handsome “stray.” The story here. More: Animal lovers are worried about Stanley the giraffe – more here. Heroes continue to perform their daily miracles! Many blessings and thanks to the firefighters!